Now that is a body kit! New, right from the road up, the Victor heralds a new generation of cars... lower, swifter, more efficient. The low roofline of the Victor is only 58 inches high! Though built so low to the road, headroom is generous and ground clearance ample. This very modern design pays big dividends in easy driving. Weight is kept low and there is a new flat-ride suspension system. So the Victor shows remarkable reluctance to roll on corners. Sure-footed safety is designed right into the Victor. Powered by a new, deep-skirt 'square' engine, the Victor is very much a top gear car - with swift, smooth top gear acceleration from walking pace into the middle seventies. This top gear flexibility cuts petrol consumption, too. Because the Victor's 'square' engine performs so efficiently throughout its whole speed range, it puts the Victor far ahead of its class for all-round fuel economy. Three's company in the front or rear seat of a Victor when one is a child. There's no less than 52 inches of hip room in this roomy four seater! These youngsters show how much room there is in the rear seat of a Victor. Put a grown-up between them and they've still got fidget room. Testing a Mercedes in a wind tunnel. The ribbons show how air is flowing over the body, and can indicate regions of turbulence. What price a freshly painted brand new bodyshell nowadays? I know I must have seen a 3-door when they were current - there was a large Nissan dealer just a few miles away and the marque was everywhere around here. But any Stanza is a rare sight these days, and every one I recall seeing has had five doors. When did you last see one? Testing the doors resistance against side impact. Testing of the seat belts. Testing the roofs resistance in roll-over accidents. A mechanism testing the resistance of the bonnet. 0-60 in 4.1 seconds. Anyone would think it had two engines. The latest Porsche Turbo pulls up alongside you at the lights. You are driving what to all outward appearances is a normal Scirocco. The lights change. The Porsche accelerates hard. And there he is, in your rear mirror. If you could see his face it would harbour an expression of utter disbelief. All this is an interesting piece of fiction which could become fact, should this Scirocco, now a fascinating experiment, come into limited production. But at present this twin-engined Scirocco is just an example of Volkswagen's obsession with power allied to four-wheel drive. And it proves the point yet again that the more power you produce, the greater your responsibility to all concerned to provide the road-holding capability to match. In both areas, the twin-engined Scirocco excels. Ah, but there has to be a snag. An engine in the boot. With four cylinders in the expected place, up front, and another four in the unexpected place, the rear hatch, there's not a lot of carrying space. Although it is probably fair to say that the owner of the Porsche 911 turbo will not be congratulating himself that he has given you a thrashing on boot space. When perhaps he would prefer an engine in the boot. He'll be far more interested in finding out how you came to be driving a Scirocco which takes you from 0-60mph in 4.1 very invigorating seconds and from a standing to 106mph in a mere 11.9 seconds. 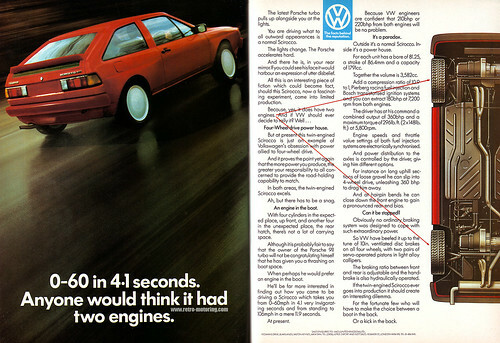 Because VW engineers are confident that 210bhp or 220bhp from both engines will be no problem. Outside it's a normal Scirocco. Inside it's a power house. For each unit has a bore of 81.25, a stroke of 86.4mm and a capacity of 1791cc. Together the volume is 3,582cc. Add a compression ratio of 10.9 to 1, Pierberg racing fuel injection and Bosch transistorised ignition systems and you can extract 180bhp at 7,200rpm from both engines. The driver has at his command a combined output of 360bhp and a maximum torque of 296lb.ft (2x148lb.ft) at 5,800rpm. Engine speeds and throttle value settings of both fuel injection systems are electronically synchronised. And the power distribution to the axles is controlled by the driver, giving him different options. For instance on long uphill sections of loose gravel he can slip into 4-wheel drive, unleashing 360bhp to drag him away. And at hairpin bends he can close down the front engine to gain a pronounced rear-end bias. Obviously no ordinary braking system was designed to cope with such extraordinary power. So VW have beefed it up to the tune of 10in. ventilated disc brakes on all four wheels, with two pairs of servo-operated pistons in light alloy calipers. The braking ratio between front and rear is adjustable and the handbrake is also hydraulically operated. If the twin-engined Scirocco ever goes into production it should create an interesting dilemma. For the fortunate few who will have to make the choice between a boot in the back. Or a kick in the back.